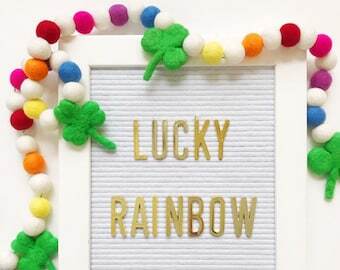 Lucky Rainbow Felt Ball Garland, Bunting, Banner - 50 Felt Balls/Shapes - St. Patrick's Day, Clover - READY TO SHIP! Announcement *** During our Big Sale on 4/18 no other Discount Codes can be used at checkout! *** Welcome to Pearl & Jane! We specialize in making Home, Holiday, & Party Decor! When we first opened up shop we were most known for our use of Gold & Silver Color Tones. Since then we have added several new materials to make unique Garlands and Pillows. To see more of our work and styles visit our Instagram page @pearlandjane. Most of our made to order items have a turn around time of up to 5 business days. Products that require customization may take up to 2 weeks. We are working hard to have shorter turnarounds for our Holiday items when possible and supplies are in stock. There are several banners that are "Ready To Ship" (will state this in the title), and we are working hard to add more. Check the "Shipping" tab in individual listings for more details. We do love taking Custom Orders! Depending on the number of items in your order - most custom orders usually take 2-3 weeks prior to shipping. We will also be taking a more limited number of custom orders each month starting in 2019 - so make sure you don't wait to place your order. There are additional fees for custom items that are not currently listed in the shop. Please message us for details and pricing. Discounts and coupon codes are not allowed to be used on items that are not currently listed. *Please note - we do no accept cancellations. Especially with Holiday Items. Once and order is placed a change cannot be made. We carry Holiday items year round. So if you place an order for an upcoming Holiday - please make sure the turnaround time including shipping time is taken into consideration. Orders are shipping in the order they are received. *** During our Big Sale on 4/18 no other Discount Codes can be used at checkout! *** Welcome to Pearl & Jane! We specialize in making Home, Holiday, & Party Decor! When we first opened up shop we were most known for our use of Gold & Silver Color Tones. Since then we have added several new materials to make unique Garlands and Pillows. To see more of our work and styles visit our Instagram page @pearlandjane. 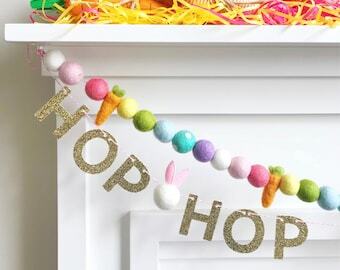 Easter Flowers Felt Ball Garland, Bunting, Banner - Easter, Spring - READY TO SHIP! White Floral Sequin Pennant Banner, Bunting, Garland - READY TO SHIP! Strawberry Themed Felt Ball Garland, Bunting, Banner - White, Pink, Red, Mint, and Turquoise - READY TO SHIP! Boy Stripes Fabric Pennant Banner, Bunting, Garland - Red, White, Yellow, Orange, Blue - READY TO SHIP! 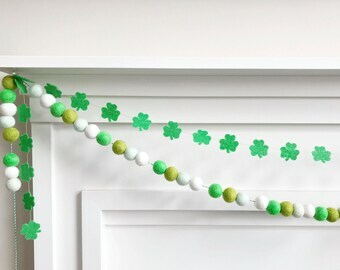 Superhero Star Felt Ball Garland - Green, Red, Blue, Yellow, Ivory - with Swirls and Polka Dots - READY TO SHIP! Pineapple Party Felt Ball Garland, Banner, Bunting - READY TO SHIP! It's getting SpOoKy around here!! 3 New Strawberry Felt Ball Garlands Listed and RTS!! 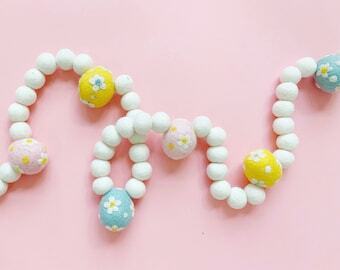 Strawberry Themed Felt Ball Garland, Bunting, Banner - White, Pink, Aqua, and Red - READY TO SHIP! Cutest Party Theme now in the Shop!!! Pearl & Jane was officially a shop with products at the end of 2013! The name comes from my two girls - one who has the middle name of Pearl, and the other has the middle name of Jane. They are my world and the reason I had the courage to start a business where I could use my creativity and help support our little family at the same time. It has been an amazing adventure and I cannot wait to see what the future will bring! I am so lucky and have an incredibly supportive husband that has encouraged me every step of the way. I work hard to put my creative style into everything I make. Thank you so much for stopping by! I would not be where I am today without the love and support of my customers! I love working on custom and personalized orders. These orders may take more time to make due to the amount of work that it takes to create something with a new design. The standard turnaround for custom orders is 2-3 weeks. There will be an additional cost if it is an item that is not currently listed in my shop. Custom orders will have a minimum of an additional $5 custom design charge per item. If pictures of fabric samples are requested there will also be an additional charge of at least $5 on top of normal custom fees. Pictures will not be sent until your order has been placed. There will be no returns or exchanges on any custom orders. Please contact me for more details.